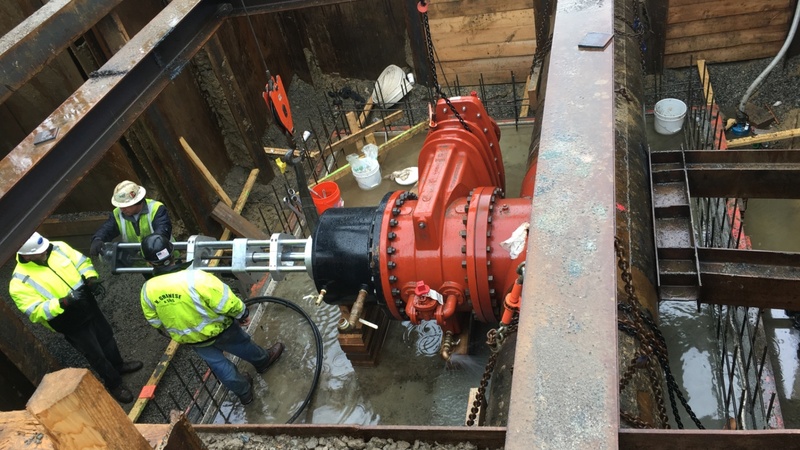 One of our contracts from last year was to furnish, install and cut a 36″ x 30″ welded on tapping sleeve and valve for P. Gioioso & Sons who is the general contractor on MWRA Contract 6454 – Southern Extra High Pipeline. The photos taken show the progression of the work. On Day 1, the pipe and sleeve are prepared for welding and the sleeve is welded on. A mag particle test was performed upon the completion of the welding. Then a tapped blind flange is mounted to the welded on sleeve and air tested. On Day 2, the 30-inch Clow flanged x flanged valve was mounted onto the sleeve. The valve was closed fully and another air test was performed on this installation. On Day 3, the valve was re-opened to confirm the turn count (586 turns) and the tap was made. SSPLS wants to thank their vendors for providing timely submittals and delivery for the sleeve and the valve as well as P. Gioioso and Sons for the wonderful excavation we worked in. It also helps that this installation is going to have a vault built around it.